In our home life and the time spent getting away, single-use plastics are becoming an increasingly large issue that won’t go away unless we act fast. Sidrah is a writer and marketer at Waterlogic, an international provider of office water dispensers and has contributed to many blogs on environmental issues such as improper waste disposal, the use of single use plastics, water pollution and is passionate about health research, medical discoveries and environmental news. In the hope of making a difference to the current global crisis, Sidrah has been working to raise awareness about plastic pollution and to encourage people to assess their own relationships with this omnipresent material. A recent World Health Organization study detailing elevated levels of microplastics in bottled water shows we may be witnessing a poetic justice for our oceans. An upward of 90% of bottled water may contain microplastics that could damage human health. So, while we have spent half-a-decade polluting the waterways with plastic, those water supplies may now be polluting us. In 1907, a Belgian-born American named Leo Hendrik Baekeland made a startling discovery: If you mix a phenol and formaldehyde, the result is a synthetic material with which you can use to make all sorts of exciting objects. It did not take long for the invention to find its way into the everyday goods we use today. During the 1940s, the industry kicked off the modest production of plastic bottles. These were, at the time, expensive to produce due to constraints in the manufacturing capabilities at the time. This rapidly expanded into a global enterprise, producing more than one-hundred million metric tons of plastic by 1989. 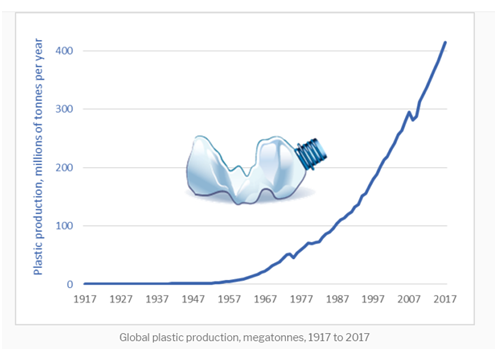 While plastic consumption stabilized in Europe at the turn of the millennium, we have witnessed the rise of plastic production by a staggering 67.5 percent across the globe since 2002. Moreover, where Europe has experienced modest population growth in the last fifteen years, population expansion at a global level remains on a steep upward trajectory. As the global population grows and plastic consumption increases per capita, these two trends suggest the problem will only intensify. A Sea of Plastic – Who Is To Blame? Did you know we have produced a cumulative total of more than 9 billion tons of plastic in the last 67 years? Just 9 percent of that has ever been recycled; 12 percent incinerated and the remainder has made its way to open dumps, gullies, rivers and eventually into the seas and the oceans. 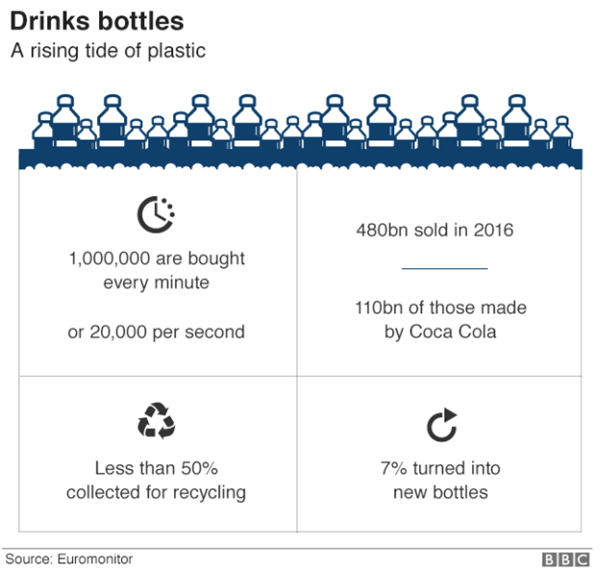 There are many culprits, however, indicators point back to the invention of the plastic bottle. More pertinently, changing production patterns and consumer habits have led to an over-reliance on single-use plastics. There must be increased effort to rid society of items that have such a limited lifespan, instead focusing on environmentally friendly alternatives. Overall, poorly coordinated waste management policies and low recyclability have only aggravated the problem, resulting in the suspended islands of rubbish that now plague the globe. In a recent discovery, Captain Charles Moore drifted into a garbage patch greater in size than Mexico, which is yet another reminder of just how grave and under-estimated the current crisis is. The fact that such extensive wastelands have accumulated at sea with little-to-no realization should sound the alarm. Even more arresting is an estimation that the seas contain a plastic-to-plankton ratio of 1:2. Given the importance of this tiny foodstuff in sustaining broader populations of marine life, there are significant grounds for concerns around micro-plastics entering the waterways. By many estimates, most of the plastic ever produced is still in existence. Most plastics break down into smaller particles and sick, what we see floating on the surface or across beaches is a small fraction of what is across the oceans. While it’s clear the plastic bottle has a lot to answer for, an equally disturbing fact points the finger in only a handful of directions. Just ten rivers across the globe contribute upwards of 90 percent of plastic pollution. While such a concentration highlights that the few must take significant action to redress the imbalance, everyone has a pivotal role to play in reducing unnecessary consumption. Moreover, where the behaviors of pockets of individuals may have a disproportionate effect – be that for an island nation, where there is a biodiverse ecology, or where individuals rely on the health of fisheries or waterways in general – the importance of collective action becomes ever more important. A store in Amsterdam recently unveiled the first plastic-free aisle in what could be a watershed moment for the world. Should such an initiative prove to be successful, others could soon follow suit. Then, at a global level, there are a number of campaigns taking hold as the UN Environment leads the way with the Clean Seas campaign aiming to eliminate the primary sources of ocean litter including microplastics in cosmetics and single use plastic, all by the year 2022; while World Environment Day is focusing on its own theme centralizing on Beat Plastic Pollution. There are many ways you can contribute to reducing plastic pollution. It is now coming down to individual decision making, alongside coordinated action by those setting policy, as well as those in the industry. Say No to Single Use: If you’re offered a single-use item such as straws, bottles, cutlery, coffee cups or plastic bags, just say no. Carry your own reusable version such as reusable metal straws, refillable bottles to stay hydrated, cloth bags for your groceries and refillable coffee cups. Avoid Packaging: Plastic-free aisles are rare but choose foods with minimal packaging; and buy loose fruit and vegetables where possible. Avoid Microbeads: Avoid health and beauty products with micro-beads and avoid any product that contains the worst types of plastics: Polyethylene (PE), polypropylene (PP), polyethylene terephthalate (PET), polymethyl methacrylate (PMMA), polytetrafluoroethylene (PTFE) and nylon. Don’t Buy Disposable: Single use items such as razors contribute excessive waste – opt for razors with replaceable blades. Choose Your Takeaway Wisely: Food packaging, including hot food, is often one of the worst offenders with polystyrene (PS) an especially damaging plastic. Does It Come in Glass? Ask yourself if you can buy the product in a glass container. Products such as sauces, dressings, marinades and pickles all come in glass packaging. Anytime you make a purchase, favor glass over other forms of packaging, and re-use your old glass. If you can’t re-use, recycle. Call for change: Make your voice heard by asking decision makers to implement policies which reduce single-use plastics and businesses to make smarter choices about their plastic use through. Even at this rate, it could still take an upward of ten years to return the oceans to a more acceptable state. Therefore, it is more important than ever to be mindful of plastic packaging, explore reusable alternatives and take part in local activities to rid your community of plastic waste. The final push will be on government, lawmakers and leadership to actively push through bans, the enactment of new policy, and introduce into law measures that control both the production and consumption of plastics.